In today’s age of global standards, media and civil society scrutiny, it is understandable that many firms have opted to create dedicated units towards enhancing their contributions towards society. Ensuring responsibility in business is not merely a fad, but rapidly becoming the norm in the corporate world. According to the World Bank’s Markus Kitzmueller, firms are investing more in the provision of public goods, asserting that “more than half of Fortune Global 250 firms provide regular public statements exclusively discussing CSR initiatives they undertake, and approximately 10 percent of S&P 100 companies report in detail on CSR activities.” Likewise, the US Social Investment Forum (SIF) reports that U.S. and European markets had over 2 trillion USD and 300 billion EURO in certified socially responsible assets in 2006. With firms differing in size and scope, there is no standard template which governs the choice and size of involvement in CSR. Some larger corporations with sizable capital engage in more macro CSR initiatives, such as the MTV Corporation with its MTV EXIT campaign for ending human exploitation and trafficking in Southeast Asia, while smaller enterprises may seek out community development programmes in their immediate neighbourhood. Clearly, firms are not development agencies. Profits drive the private sector’s ability to even deliberate contributing to corporate responsibility. Nonetheless, contributing towards sustainable development should be carefully planned with interventions that are based on context, needs and effects. Rather than public relations, ultimate impact and accountability to beneficiaries should remain the guiding principles of any CSR intervention. This is also in the company’s interest: a poorly planned and executed CSR intervention can be as damaging to a firm’s credibility than not engaging in CSR at all. As a development practitioner slowly turning towards the private sector, I often analyse CSR initiatives in terms of impacts and utility, looking at ways in which projects or initiatives which can demonstrate concrete development impacts or multiplier effects that are sustainable. For example, building a well in a remote village may seem a laudable initiative but its ultimate utility can be understood only with additional information: what was the planning process like? Did the project respond to an actual demand? How many people have benefited from the well? Has it created conflicts for access to water among neighbouring communities? Were there other wells in the vicinity? How much did it cost to construct? Was the cost somehow offset through deductions on the firm’s taxable profits? Was the procurement process transparent? Did the workers have a minimum level of safeguards which allowed for health and safety protection? Assessing planned interventions through feasibility studies and needs assessments upon the inception of a project/programme is therefore a necessary pre-condition to successful CSR projects. While global data on CSR is scarce and it is difficult to determine the degree to which firms engage in feasibility studies prior to action, many firms, particularly smaller ones, do not engage in such exercises. The result is CSR projects that have no impact and are ignored by its intended beneficiaries. In addition to baseline assessment, firms should monitor the impacts of their interventions and disclose these through comprehensive and accessible reports. Fortunately, because of the growing attention to CSR practice a number of standards have emerged to help firms in creating or strengthening their CSR. These include the AccountAbility’s AA1000 standard, the Global Reporting Initiative’s Sustainability Reporting Guidelines and the UN Principles of Responsible Investment (PRI). Two useful ways in which firms can ensure they are implementing CSR initiatives that have value and purpose involve both regular monitoring and evaluation (M&E) and adapting CSR principles to ISO 26000. Let me briefly touch upon each of them. A precondition for effective monitoring and evaluation is the setting of clear objectives, outcomes and measurable indicators and establishing a system for periodically gathering and digesting information to ensure impact analysis feeds back into the design and implementation of the CSR initiative. The Madrid-based Corporate Excellence: Centre for Reputation Leadership has created a concise document that can serve firms in starting-up or tailoring their CSR strategies for feasibility and impact. The information leaflet How to manage CSR programs efficiently and convert them into feasible projectsaddresses issues including why some CSR projects fail, the importance of the project management and implementation cycle, along with useful points to deliberate when balancing corporate aspects with non-profit objectives. Equally so, the Association for Sustainable & Responsible Investment in Asia (ASRIA), has a summarised ways in which CSR can make an impact. They highlight that most often, CSR projects end up measuring the internal impacts of their projects on their particular firm, focusing on issues such as improved staff recruitment and retention, brand loyalty and supply chain security, rather than the impacts of what has actually been done, externally, for socio-economic development. While modest, the website is full of valuable insight that focuses on outcomes and impact, rather solely concentrating on inputs and outputs. 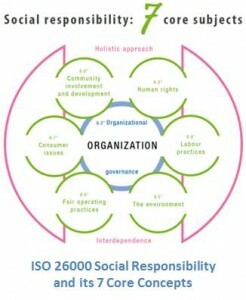 Launched in 2010, ISO 26000 was established as a guideline for helping businesses and organizations “translate principles into effective actions and share best practices relating to social responsibility” at a global level, assisting all types of organizations regardless of their activity, size or location. Unlike many of its relatives at the International Organization for Standardization (ISO), ISO 26000 was not created as a management certification standard. In other words, it cannot vouch for certified management practices. Yet, some have argued that the practicality of ISO 26000 is invaluable to firms, particularly owing to the fact that it was developed in a “lengthy multi-organizational process involving multiple stakeholder groups” and can thus be regarded as “one of the most legitimate documents on SR” to date. Management thinking Rudiger Hahn further elaborates that ISO 26000 can help “lower the need for an organization to individually search for socially accepted modes of management” and also assist in reducing bargaining costs. Furthermore, ISO 26000 conveys some excellent tools for ensuring that CSR activities also adhere to accountability in developing countries, key to those interested in setting up projects that can make their money matter, in a sustainable way. As a basic guideline ISO 26000 can assist in logically planning interventions that yield results, as seen in the 7 Core Subjects of Social responsibility promoted by the ISO. Each of the respective areas delves into deeper subsections covering the extent of the topic, facilitated by useful case studies from CSR projects and providing special attention to instances in the developing world. Firms come in all shapes, sizes and financial accounts. Not all of those interested in CSR can allow themselves to tackle the challenges of the developing world. Community development projects and sustainability initiatives in OECD countries are not any less valuable in terms of their level of involvement. Yet, regardless of whether a firm chooses to go global or remain in their own backyard, social responsibility encompasses far more than the idea of corporate citizenship – it also involves a dedicated response to making the needs of the beneficiary a primary responsibility. Tomislav Ivancic is a tri-national of Croatia, Canada and Italy, currently based in London. His experience includes working as a consultant for UN agencies such as the International Trade Centre (ITC), the International Labour Organization (ILO), the United Nations Development Programme (UNDP), alongside management consulting with firms in London and Bilbao. Tomislav holds a BA Hons from the University of Toronto, an MA in International Relations and European Studies from the Central European University in Budapest and an MSc in Local Economic Development from the London School of Economics.